Perioperative care in head and neck burn injuries is complicated by physiologic derangements due to massive destruction of tissues that affect virtually all organ systems and alter patient response to anesthetic agents. Localized burns to head and neck can result in erythema, ulceration, and edema. However, clinical symptoms such as dyspnea and stridor may not develop until the edema significantly decreases airway diameter. Here, we present a patient with electric burns over head and neck with no symptoms of airway collapse in preoperative phase. However, the patient was diagnosed with a defect in the continuity of airway and difficulty in vocalization during preoxygenation. The further management and related complications have been described. Informed and written consent was obtained from the patient. A 35-year-old, 73 kg male, who was an electrician, sustained high voltage electric burns while working over an electricity pole. His right side of neck, chest, hand, and left back area were affected, amounting to 20% of total body surface area. He was initially treated at a local hospital and was referred to our institute for further management. The patient came to our hospital 5 days after his injury. Here, the patient was planned for debridement and flap coverage on the burnt area. Preoperative evaluation revealed normal routine investigations. Patient had normal vocalization with muffled speech. A huge dressing was present around the neck. There was no history suggestive of dyspnoea or orthopnoea. On examination of the airway, there was no facial abnormality, mouth opening − 1.5 cm, and Mallampatti grade 4 was noted. Considering neck injury and dressing around neck, cervical extension and flexion could not be assessed. Ultrasound Doppler of the neck showed normal common carotid artery and internal jugular vein. His cervical roentgenogram showed normal midline tracheal shadow [Figure 1] and [Figure 2]. Patient was explained the following operative procedures: anticipated difficult airway, possibility of awake intubation, tracheostomy and elective ventilation in the postoperative period. No sedative premedication was advised considering a difficult airway. Injection glycopyrolate 0.2 mg intramuscularly was given 30 min before shifting to operating room. He was nebulized with 4% lignocaine 20 min before shifting inside operation theatre. Besides appropriate size oral and nasopharyngeal airways, videolaryngoscope and fiberoptic bronchoscope were also kept ready. Preoperatively, standard monitoring was established, and wide bore intravenous cannula was secured. On the removal of huge dressing around the neck, slough was present without obvious external breach in the continuity of the airway [Figure 3]. Thyroid cartilage was seen in the midline moving with deglutition, and mouth opening was judged to be adequate for passing fiberoptic bronchoscope. Our plan was preoxygenation to an end tidal O2 more than 90% using venturi face mask (FiO2 0.60) followed by fiberoptic intubation using spray as you go technique. However, during preoxygenation, capnograph trace was damp despite a well-fitting face mask. On inspection, air bubbles were seen in the slough around the neck [Figure 4]. At this point, patient also developed difficulty in speech and SpO2 dropped to 85–90%. Anticipating underlying tracheal defect, oral fiberoptic intubation was abandoned and a decision to do tracheostomy under local anesthesia was taken. The procedure successfully restored ventilation of both the lungs. Subsequently general anesthesia was induced using 75 μg fentanyl, 80 mg propofol and atracurium 25 mg. An arterial cannula in right radial artery was secured after induction of general anesthesia. General anesthesia was maintained on intermittent positive pressure ventilation using O2, nitrous oxide mixture with isoflurane maintaining hemodynamics within 20% of the baseline. The surgery was started, and it was found that burn had also involved the hypopharynx, epiglottis, and right inferior mandible. The soft tissues along right side of neck were totally sloughed off including anterior wall of internal jugular vein, which got ruptured during debridement. This required ligation of two ends of the internal jugular vein to control bleeding. Meanwhile the patient became hemodynamically unstable and was resuscitated with crystalloids. After debridement, nasogastric tube was inserted, which was placed into the exposed esophageal lumen. Tracheal rent was covered with pectoralis major myocutaneous flap. At the completion of the procedure, injection neostigmine 3.5 mg, injection glycopyrolate 0.6 mg was given for the reversal of anesthesia. Patient was shifted to burn intensive care unit with tracheostomy in situ. 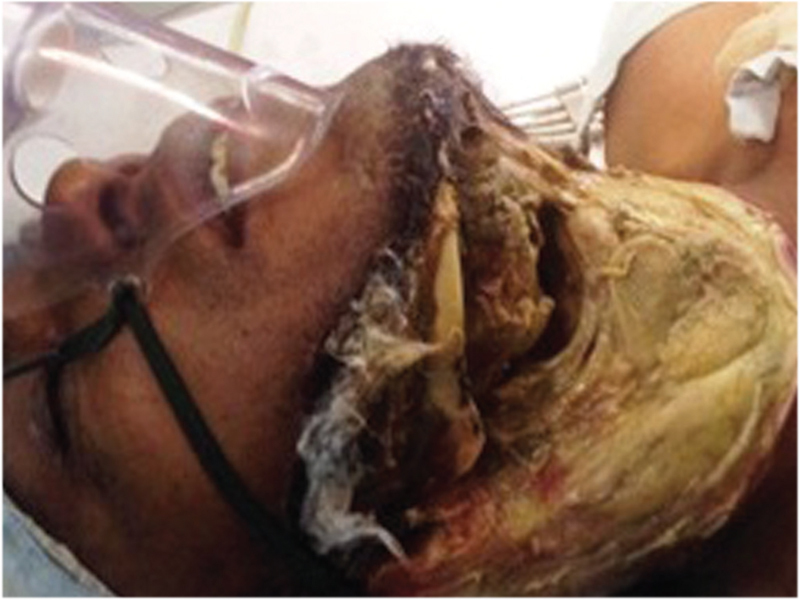 Subsequently, the patient required two additional debridement and revision of flap under general anesthesia. Presently the patient is recovering well. However, the patient’s speech functions are still impaired. In literature electricians comprise 47.16% of victims. The most common mode of injury was touching a live wire directly or indirectly, and was seen in 63.6% of victims. The young adults were associated with electric burns of head and neck due to their carelessness and risk taking behavior. Another reason is the lack of public awareness about the precautions such as using helmets, electric gloves and so on. Burns of the neck are devastating in the way that they can damage the vital structures present in anterior and lateral side of neck. Neglected burns often lead to necrosis of underlying tissues and subsequently slough formation occurs. Injury to pretracheal fascia can lead to minor rents in the trachea, which may not manifest during spontaneous respiration. In the preanesthetic check up, due to massive dressings in the neck area, detailed airway examination is not possible. Thus, it is possible that one may miss the important finding of any airway defect preoperatively because it is covered under thick dressings. The removal of dressings in burn patients is in itself one painful procedure. Therefore, dressing should only be removed in the controlled environment, taking all possible precautions for the need of emergency tracheostomy and with facilities to manage interrupted airway and massive hemorrhage, in case any neck vessels are involved. The slough formation occurring in burn patients adheres to the dressings, which can lead to some loss of skin and underlying tissues on removal. In the present case, no defect was seen during spontaneous ventilation due to presence of thick dressings. However, when the patient was being preoxygenated, using venturi face mask, due to deep breathing, slough was dislodged, and tracheal defect was noticed. Limited literature has been found, wherein the burn injury has directly led to tracheal defect. Seidl et al. conducted a retrospective study of 1693 burn patients requiring ventilation after injury. They found tracheal rupture in two patients (0.1%) following immediate orotracheal intubation after injury. Authors suggested that a surgical intervention should be performed without delay. In contrast, Tan et al. 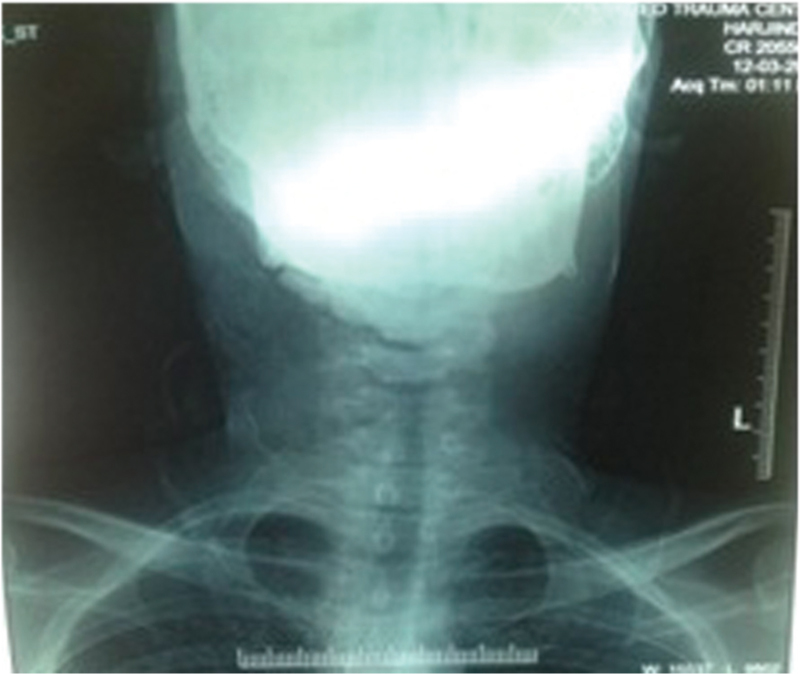 reported an occurrence of trachea-oesophageal fistula following intubation in a burn patient. Eipe et al. 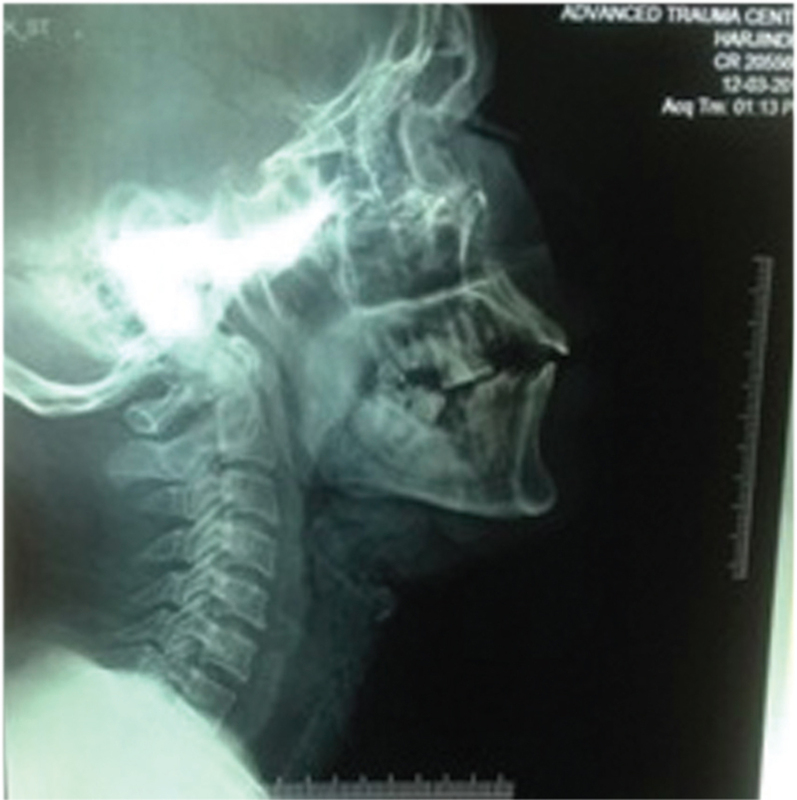 reported a case of electric burns, where emergency airway management was performed by inserting the tracheostomy tube through the tracheal defect. However, their patient subsequently developed trachea-oesophageal fistula, which required surgical intervention. In our patient, the severity of injury was underestimated by the local practitioner, which led to a delay in referral and subsequent management. However, the removal of dressing in the operating room, where immediate tracheostomy was performed improved the outcome of the patient. We wish to emphasize that airway manipulation in burn patients should be performed very cautiously. Literature reveals that iaterogenic tracheal disruption can produce progressive life-threatening surgical emphysema. Chauhan et al. reported subcutaneous emphysema because of undetected tracheal injuries. The importance of detailed radiographic investigations cannot be undermined, especially in burns involving head and neck region. The neck radiograph should be carefully examined for the integrity of the trachea. If possible advanced investigations like computed tomography scanning of the head and neck can beperformed. Literature is also available regarding the role of ultrasonography in detection of airway injuries. In our patient, because of presence of slough and uncertainity about the integrity of underlying structures (trachea and major neck vessels) this modality was not considered. The postoperative management also depends on the perioperative course of the patient. In burns involving the airway, suspicion of airway edema is always there. Had our patient not undergone elective tracheostomy, we would have preferably kept patient intubated for 24–48 h for elective ventilation. This would have been accompanied by round the clock administration of steroids to reduce airway and surrounding tissues edema. Similarly, extubation would also be planned. The decision to do elective tracheostomy has to be performed on a case-to-case basis, depending upon the further course of treatment. Great caution should be practiced in airway management of patients with electric burn of the neck. Due to presence of thick dressings over the raw area, airway examination becomes difficult. Noninvasive diagnostic modalities like head and neck roentgenogram, ultrasonography should be used diligently to diagnose the integrity of airway structures. The use of fiberoptic bronchoscope guided intubation also helps in detecting airway edema or collapse. Blind insertion of airway devices through the slough should be avoided because it can lead to massive bleeding or formation of fistula. In conclusion, management of burn neck patients is challenging and involves multidisciplinary approach in a setup where adequate facilities are available for favorable outcome. The authors certify that they have obtained all appropriate patient consent forms. In the form the patient has given consent for images and other clinical information to be reported in the journal. The patient understands that the name and initials will not be published and due efforts will be made to conceal the identity, but anonymity cannot be guaranteed. Docking P. Electrical burn injuries. Accid Emerg Nurs 1999;7:70-6. Rai J, Jeschke MG, Barrow RE, Herndon DN. Electrical injuries: A 30-year review. J Trauma 1999;46:933-6. Haberal M, Ucar N, Bilgin N. Epidemiological survey of burns treated in Ankara. Burns 1995;21:601-6. Craige W, MacDonald W. High voltage injuries. Am J Surg 1978;136:693-6. Haberal M. Electrical burns: A five-year experience. J Trauma 1986;26:103-9. Marshall KA, Fisher JC. Salvage and reconstruction of electrical hand injury. Am J Surg 1977;134:385-7. Garcia-Sanchez V, Morell PG. Electrical burns: High and low tension injuries. Burns 1999;25:357-60. Achauer B, Applebaum R, Vander Kam VM. Electrical burn injury to upper extremity. Br J Plast Surg 1994;47:331-40. Harbin KR, Norris TE. Anesthetic management of patients with major burn injury. Am Assoc Nurs Anesth J 2012;80:6. Baba PU, Wani AH. Pattern of high voltage electrical injuries in the Kashmir valley: A 10-year single centre experience. Ann Burns Fire Disasters 2016;29:259-63. Seidl RO, Todt I, Westhofen M, Ernst A. Tracheal rupture in burns − A retrospective study. Burns 2008;34:525-30. Tan KK, Lee JK, Tan I, Sarvesvaran R. Acquired tracheo-oesophageal fistula following tracheal intubation in a burned patient. Burns 1993;19:360-1. Eipe N, Pillai AD, Choudhrie R. Burns and tracheo-oesophageal-cutaneous fistula. Br J Anaesth 2005;94:132-4. 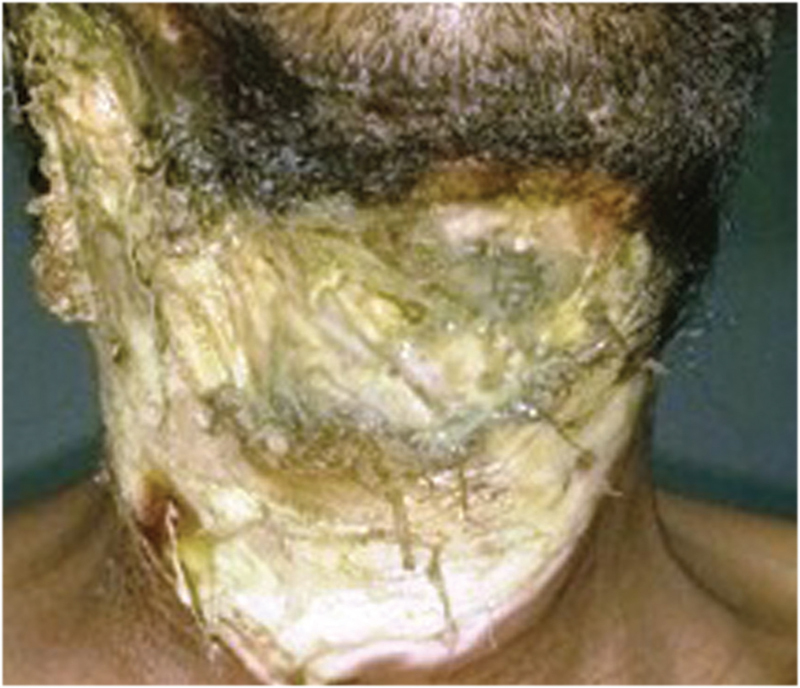 Chauhan A, Ganguly M, Saidha N, Gulia P. Tracheal necrosis with surgical emphysema following thyroidectomy. J Postgrad Med 2009;55:193-5.